History: (Super Soldiers#8(fb)) - Mercy were formed as an offshoot of SHIELD, set up as part of their super soldier program. They put six people through the process before the U.S. defence budget cuts curtailed their work. They began lobbying the U.N. security council to use their super human operatives on peace keeping missions. Secretly, Stasser began siphoning Mercy funds into offshore accounts, in order to set up a shadow, parallel corporation. 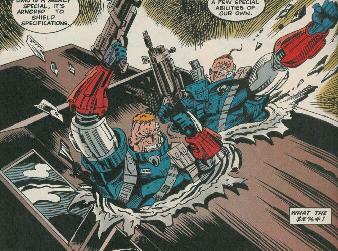 (Super Soldiers#8) - Mercy sent Mr Keel and Mr Reno to protect General Jose Luis Endaro, in the Republic of Yaritagua, off the Caribbean coast of Columbia. 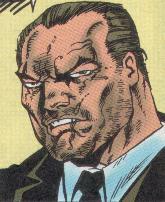 The General was in charge of a cocaine dealing pyramid, and had attracted the attention of the Punisher. 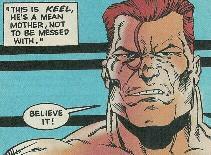 When the Punisher attacked the General, Keel and Reno revealed themselves, and he made a strategic retreat. Mercy increased their fee for protection. Meanwhile, the Super Soldiers funding had been cut by the Cabinet Office. Mr Stasser recruited Dalton, Gog, Guvnor, and Hauer and brought them to Mercy Science Central, Alaska. There they were introduced to Mercy's group of malcontents, and Dr Bohemia Downes, the lady responsible for their own super soldier program, before undergoing tests on their powers. 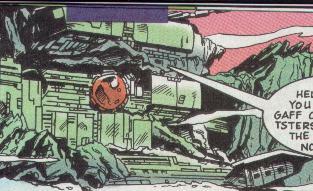 Stasser was contacted by people in Yaritagua who wanted General Endaro dead, and decided he would try and set up the Punisher to do it for them. COMMENTS: Created byLee Stevens and Mike Ratera for Marvel Uk. Super-Soldiers#9 and 10 were scheduled to be part of the "Red Mist" cross-over storyline, which never came out. 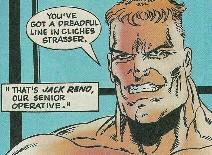 It involved a virus accidentally induced in government's super soldier program, set have run thru new series Death Duty, 'Roid Rage, and Bloodrush, as well as Wild Thing#9+10. 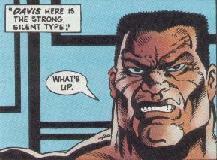 Super-Soldiers#9 would also have featured the Punisher (Frank Castle).--Snood. Also refered to as Mr Reno, he was sent on a mission to protect General Jose Luis Endaro where he encountered the Punisher. His steroid based abilities were created by a derivative of the super soldier serum. Those abilities included superhuman strength (class 10) and endurance. However, tests showed their abilities were not as effective in combat as the adrenaline based abilities of Hauer and Dalton. Accompanied Mr Reno on the mission in Columbia. Had the same steroid based abilities. 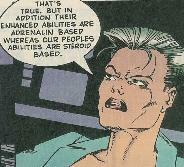 While Kyle had the same abilities as Reno and Keel, she was known to be suffering due to a steroid based mutagenic agent that was altering her genetic structure and would have eventually caused both mental and physical transformations, possibly death. This was causing erratic behaviour, and she was injecting huge amounts of steroids. Villarosa had the same steroid based abilities as described above, but was not known to be suffering from the mutagenic effects. 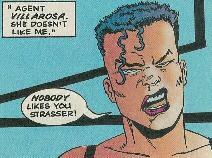 She didn't trust Strasser. Another steroid based super agent, he was not known to be suffering from the mutagenic agent. 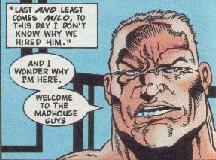 Like Kyle, Milo was behaving erratically and injecting steroids in huge quantities as a side effect of the mutagenic agent. Stasser was the callous boss of Mercy Corporation. He had no super human powers, but was a skilled businessman. Downes was the scientist responsible for Mercy's super soldier program. She demonstrated a knowledge of biology, genetics and superhuman physiology and powers.